Need some wedding congratulations?. 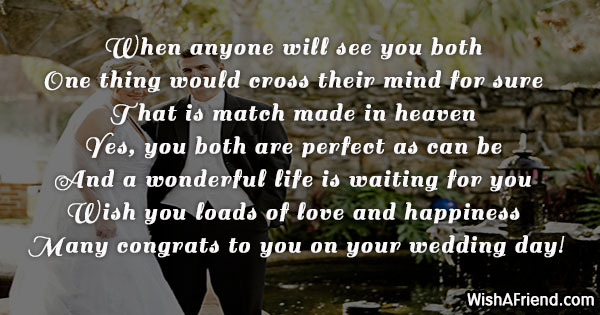 Get some awesome Wedding Congratulations right here. 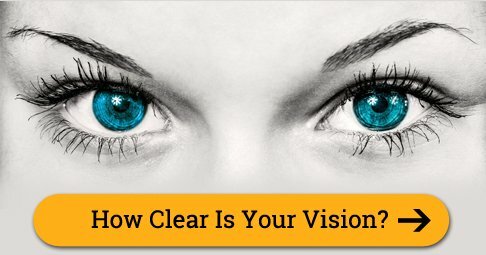 You can share/send them to your loved ones via Text/SMS, Email, Facebook, Whatsapp, IM etc. 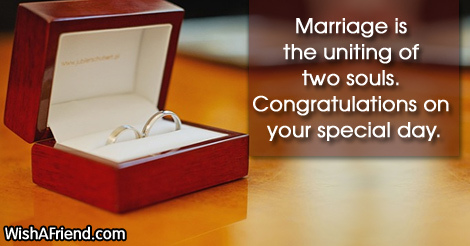 Marriage is the uniting of two souls. 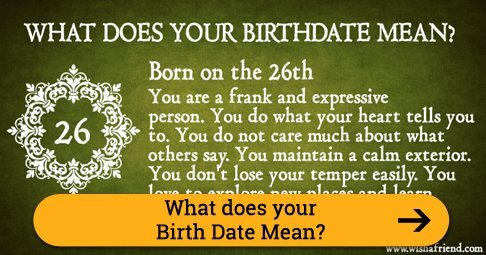 Congratulations on your special day. 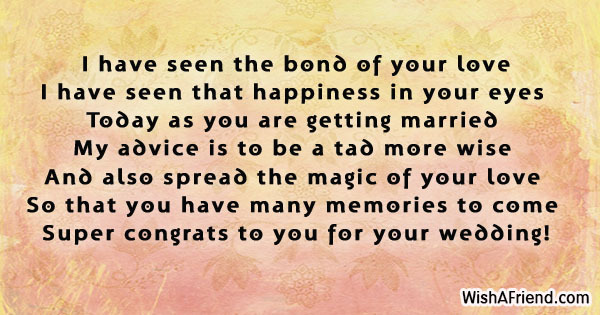 May your marriage bring great joy, love and passion in your life. 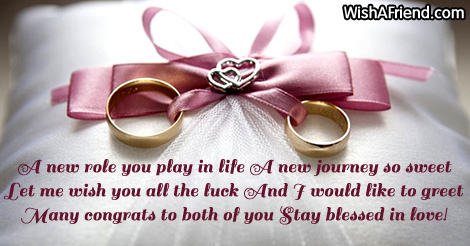 I wish to God to bless you with a wonderful marriage and a happy life ahead. 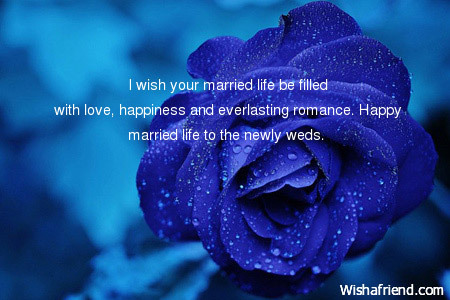 I wish your married life be filled with love, happiness and everlasting romance. 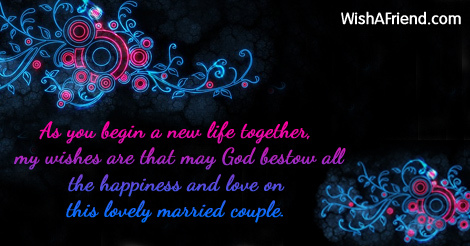 Happy married life to the newly weds. 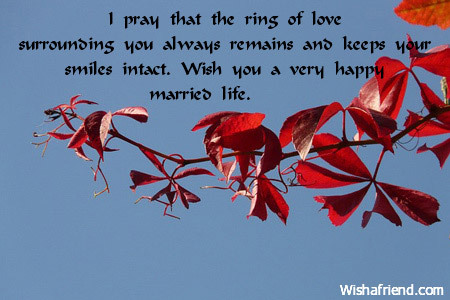 I pray that the ring of love surrounding you always remains and keeps your smiles intact. 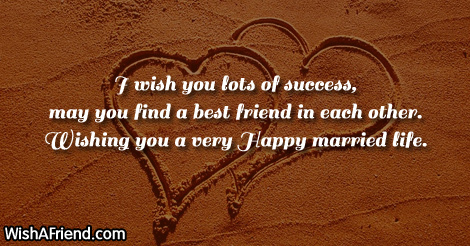 Wish you a very happy married life. Super congrats to you for your wedding! 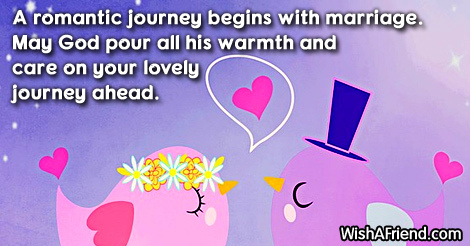 A romantic journey begins with marriage. May God pour all his warmth and care on your lovely journey ahead. 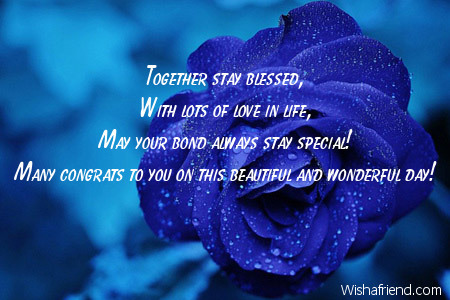 Many congrats to you on your wedding day! 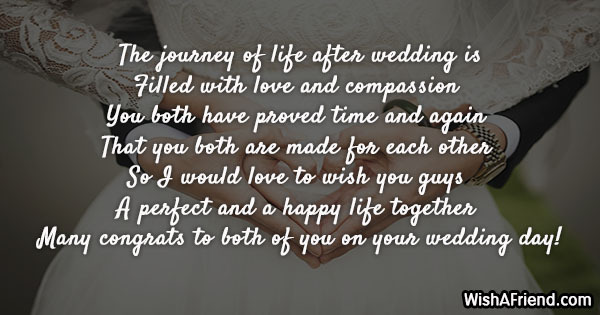 As you begin a new life together, my wishes are that may God bestow all the happiness and love on this lovely married couple. 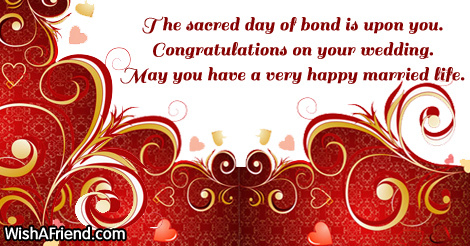 May your bond always stay special! 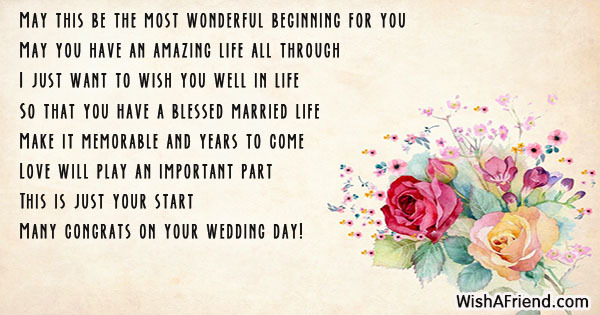 Many congrats to you on this beautiful and wonderful day! Congratulations. 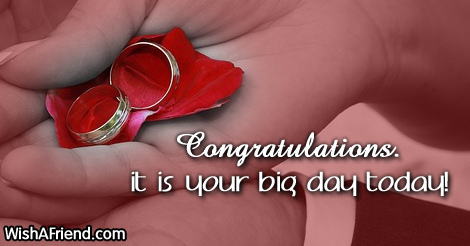 it is your big day today! Many congrats on your wedding day! Many congrats to both of you on your wedding day! 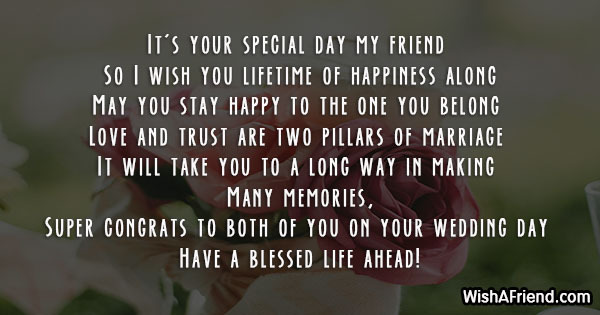 Stay blessed the two of you! 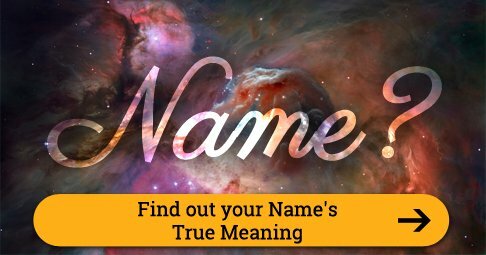 A new and sweet chapter of your life has begun. 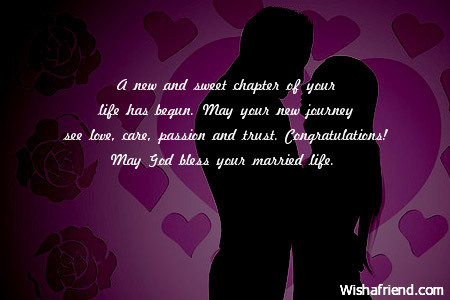 May your new journey see love, care, passion and trust. Congratulations! 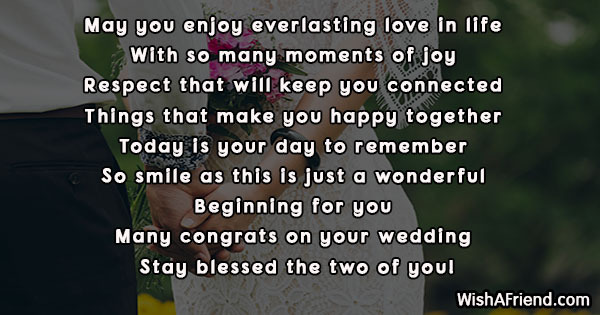 May God bless your married life.